Once again I'm anticipating Sonic Generations by reviewing a past Sonic game. What game am I reviewing this Saturday, you ask? It's none other than the first dual screen adventure for the blue hedgehog in Sonic Rush for Nintendo DS (I've already reviewed the sequel in Sonic Rush Adventure). Do dual screens make for double the fun? Should You Rush to Pick This Game Up? While Sonic the Hedgehog's 3D exploits have had varying degrees of success, his 2D adventures have fared far better. 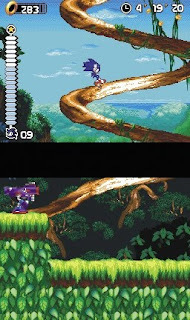 He's sped his way onto the Game Boy Advance with the Sonic Advance trilogy, each introducing a new gameplay mechanic. 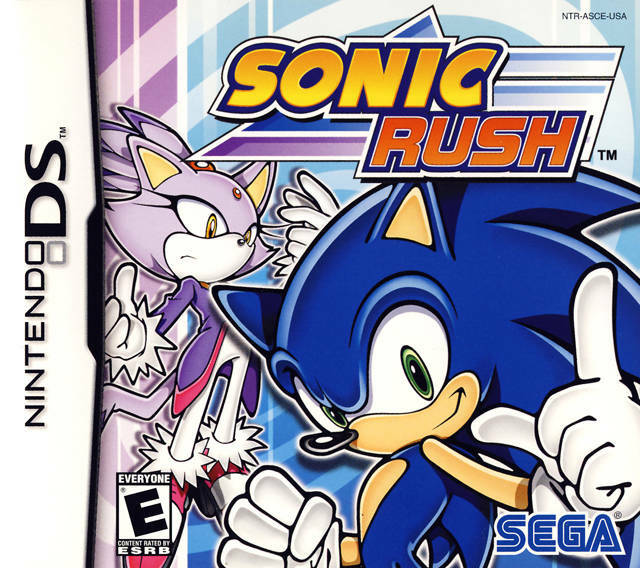 Now Sonic has made the jump to Nintendo's dual screened platform, the Nintendo DS, with Sonic Rush. Is Sonic's first DS venture worth playing, or should you speed on past it to something better? A new duo of characters from another dimension are introduced in Sonic Rush. They are Blaze the Cat, a silent feline who mostly keeps to herself and Eggman Nega, essentially Dr. Eggman with an inverse color palette. It seems that both Dr. Eggman and Eggman Nega have teamed up to try to take over both dimensions by gathering both the Chaos and Sol Emeralds. At first, the partnership between Sonic the Hedgehog and Blaze the Cat is anything but welcomed. The two actually do battle in the game. But when the chips are down and the fate of both worlds is at stake, the two decide to fight together to take out both sinister scientists before they can put their plan into fruition. It's a story that's only meant to give the player an incentive to run through the seven zones Sonic Rush has to offer, so it's quite unobtrusive. 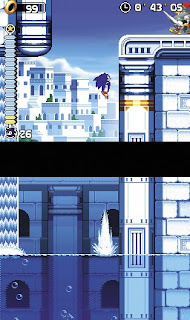 The seven zones of Sonic Rush feature a variety of locales to explore with split paths, gimmicks, and different enemies to defeat, and the action takes place across both screens. The first zone, Leaf Storm, is made up of loop-de-loops and swinging on vines to scale the insides of trees. Meanwhile, the Water Palace Zone is made up of many underwater sections where Sonic or Blaze must find bubbles to get some extra air to breathe, or else they find themselves gasping or air and thus drowning. Each zone brings new gimmicks to the table. From Mirage Road's sand slides to Dead Line's rocket rides, there's something fresh to keep players on their toes. Regardless, the level design isn't perfect. There's many rooms where the player must clear out all enemies before being able to continue on, and there's a bounty of bottomless pits. These are completely unmarked which leads to a metric ton of cheap deaths. For those new to the Sonic the Hedgehog series (where have you been? ), the game works like this. Sonic or Blaze live by having at least one ring in their possession. Collect one-hundred to earn an extra life. 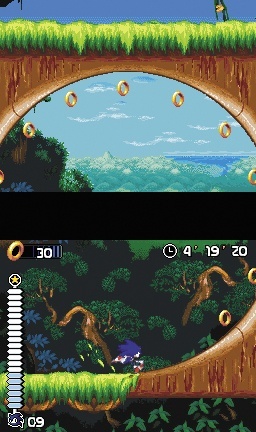 If Sonic or Blaze are hit, their stash of rings fly all over the place, leaving them vulnerable. They can grab as many of these lost rings as they possibly can as if they are damaged when they have zero rings in their collection, the player loses a life and must start back at the beginning of the act or at the last reached checkpoint. Sonic Rush has multiple paths in its acts to explore. Usually reaching the highest path takes the highest amount of skill, but it's worth it as it's generally safer with no worries about falling into an aforementioned bottomless pit. Sonic controls well in Rush. There's no homing attack to be found in this game, so he'll have to resort to bopping baddies on the noggin to defeat them or boost through them. He can perform tricks while in the air to add to his point total (players are ranked based on their performance at the conclusion of each act), and he can trick out while he grinds on rails as well. Doing tricks adds fuel to his boost gauge which allows the cerulean hog to jet through enemies and speed past obstacles. After the first zone is completed, players can opt to use Blaze. Her levels are completely different from Sonic's making for a unique playing experience. Her moves are essentially the same as Sonic's, just with alternate names. Each third act in a zone is a boss battle. These are in full 3D and take place on the top screen. Depending on the character you're playing as, either Tails or Cream will cheer you on. The first boss is a serpent who will smash its head down onto the battlefield in an attempt to hit Sonic or Blaze. While the boss has its head exposed and on the platform, your character can leap onto its weak point to injure it. When enough hits are given to a boss (you can see how much damage you've given to a boss via the bottom screen), he'll get desperate and utilize a new strategy. In the first boss's case, he'll move to the end of the platform and roll his head along it, trying to bump Sonic or Blaze off the platform and into the bottomless pit below. Well timed jumps are what the doctor ordered to stray from this fearsome fate. In order to reach the ultimate showdown with both devious doctors, Sonic the Hedgehog and Blaze the Cat will have to collect all seven Chaos and all seven Sol Emeralds. This unlocks the final fight and scenario against both Eggman and Eggman Nega. How does one collect these fourteen emeralds? It's easy peasy. In each of the first two acts of a given zone, there's certain spinners that can be grabbed by either Sonic. By using the boost powers of both characters, they can swiftly spin around the device and charge up power. Charge it up enough, and you'll find yourself inside the Special Stage going for a Chaos Emerald. Special Stages have Sonic continuously moving forward through a pipeline, collecting rings and dodging mines. Collect enough rings for each checkpoint, and you move onto the next section of the stage. Have enough golden goodness by the conclusion of the Special Stage, and you earn an emerald. Blaze on the other hand, automatically gathers Sol Emeralds upon completion of a given zone. Controlling your character in the Special Stage is done entirely with the stylus. You slide the stylus to where you want Sonic or Blaze to shift to in an attempt to collect as many rings as possible and to avoid the mines that will make them lose rings. Specific sections of the Special Stage have you tapping a series of spaces on the touch screen in order to earn a ring bonus, but you have a limited time to do so, so get tapping! With each iteration of the Special Stage, the challenge gets progressively more difficult with more intense patterns of rings and mines. There is a way to cheat the system, however. You can pause the action and hold the stylus over the area where you want Sonic or Blaze to go. Then you unpause the game, and your character will be where your stylus was. Case in point, they'll be instantly transported to the side of the screen you want them to be. This makes getting the required ring amount all the more easier. 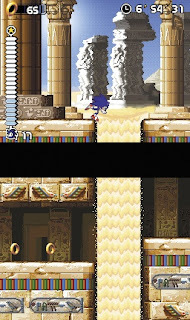 Sonic Rush uses polygonal sprites in all of its characters. They animate well, and look quite nice. It's always fun seeing Sonic breakdance as he clears an act. The backgrounds are full of noticeable details and are chock full of colors. Having the action on both screens makes for an exciting and exhilarating time. On the sound side of the spectrum, the soundtrack of Sonic Rush is composed by Hideki Naganuma, best known for his work on the Jet Grind Radio games. The music is full of radical beats, catchy themes, and vivacious vocals. It's all supremely superb, and only further enhances the rolling around at the speed of sound experience. The sound effects are what you'd expect from the Sonic the Hedgehog series, so there's no real surprises here. Sonic Rush is a speedy little game. I mean that in both gameplay and length wise. Most players should breeze through the title within 7-8 hours. The addition of a new playable character is welcomed in this case as I find Blaze the Cat to be an intriguing and fascinating feline. The music is excellent, the levels are mostly fun to play (they'd be perfect if it weren't for the myriad of bottomless pits that players WILL fall into), and the bosses pose a great challenge even if they do have cheap one-hit kill maneuvers. While not Sonic's best 2D outing, Sonic Rush is a game that Sonic fans and the developers can be proud of.